The Brexit referendum and Trump’s election were each decided by a free and fair vote, yet large proportions of UK and US citizens have trouble accepting them as truly ‘democratic’. Brian Milstein writes that a working democracy requires more than free elections; it requires additional institutions, such as a well-functioning political public sphere and a responsive political party system, to channel citizens’ voices into productive public debate and foster a sense of ‘collective democratic will’. He argues that if these institutions are in a state of decay, democratic politics can start to appear unfocused and erratic – we can even find ourselves subject to decisions that were ‘formally’ democratic, yet somehow don’t ‘feel’ democratic. Important as voting is to democratic decision-making, it is not the only part. Other institutions need to be in place, such as a well-functioning political public sphere and a responsive political party system. These institutions work to focus public debate, set the parameters of political disagreements, and foster a sense of collective democratic will. They make the outcomes of votes comprehensible to citizens, such that even citizens whose preferences occasionally “lose out” can still understand themselves as co-participants in the decisions to which they are subject. But decades of neoliberal hegemony have corroded the effectiveness of these institutions, and since the 2007/8 crisis, they have gradually lost their ability to productively manage public discontent. The problem is that, when these institutions break down, democratic politics can start to appear unfocused and erratic. What is striking about the Brexit and Trump 2016 votes is not simply that they marked victories for populist movements; it is that they were formally democratic decisions which the citizenries of the UK and US have been nevertheless at pains to comprehend as the product of a collective democratic will. Take Trump, for example, who was elected with fewer votes than his opponent. In 2000, Bush was elected not only without a plurality of votes, but only after a cloud of controversy over Florida’s electoral votes and months of litigation. And yet Bush was still inaugurated into office with broad public approval, while Trump was not. Why were U.S. citizens so much more accepting of Bush than Trump, if the former’s election was more problematic on the merits? As it turns out, voting is only one part of what makes democracy work. Citizens must be able to recognize each other as co-participants in collective political processes oriented to an idea of what is just and good for the whole. They may vehemently disagree over what is just and good for the whole, but they generally acknowledge each other’s commitments and their implications as “reasonable” (if not preferable) alternatives. In diverse, complex societies, “collective democratic will” means not that we share the same ideas but that we can recognize in procedures like voting faithful means for mediating among such alternatives and translating them into legitimate binding decisions. Thus, a well-ordered political public sphere is crucial for citizens across society to familiarize each other with their respective points of view and their reasons for holding them. As a “semi-institutionalized” domain, an effective public sphere must be sufficiently open and decentralized to allow citizens maximum freedom to raise new issues and identify new problems, but it must also possesses enough of an “infrastructure” to bring various voices of the citizenry into contact with one another, to raise broad public awareness, and to exert pressure on centres of power. Part of this infrastructure is provided by the political party system. The system of political parties serves as a “bridge” of sorts between the public sphere and formal voting, taking reasonable disagreements among citizens in the public sphere, repackaging them into governing philosophies, policy positions, organizational strategies, and then presenting them back to citizens as discrete ballot choices. But it also helps to structure political debate in the public sphere, centralizing and sorting disagreements among citizens into a navigable range of alternative viewpoints on what is just, good, and feasible for the whole. There is a catch here, however, because party systems tend also to foster a form of political hegemony, presenting itself and the major parties it comprises as exhausting the full range of reasonable alternatives. In normal politics, only that which one or more of the mainstream parties is willing to consider truly counts as “reasonable”; that which none of the parties would consider may be branded “extreme,” “fringe,” “pie in the sky,” or otherwise unviable. This is a good thing, for it prevents certain kinds of extreme positions (e.g., violent or fascist) from taking hold in the mainstream political debate. But it also allows the possibility for party systems to take on “cartel”-like behaviours, disempowering or dismissing as “unreasonable” otherwise viable alternatives from the wide public debate when they conflict with the strategic agendas of party leaders and elites. The cartel-like evacuation from public debate of social and economic questions by major parties in the U.S. and Europe has been widely noted, alongside accelerating inequality and the increasing influence of elites on politics at the expense of citizens. Parties cover for this narrowing of the political realm by redirecting public attention to cultural issues, personal scandals, and appeals to emotion and even prejudice, all the while upholding the narrative that they represent the only reasonable alternatives. Playing off of the market character of mass media, party elites appeal to the sensationalist impulses of commercial journalism to keep debate at a superficial level and discourage engagement with uncomfortable topics. Image by The Prophet, Creative Commons Attribution 2.0 Generic. Some believed the 2007/8 financial crisis, with its protracted aftermath, might finally shatter the hegemony of an ossified neoliberal establishment, initiating a kind of “legitimation crisis” that re-opens the bounds of political discourse, re-energizing the public sphere and paving the way for new ideas and new kinds of leaders. And it did unmoor the hegemony established parties previously held over public debate. But the needed expansion of debate still required a sufficiently amenable public sphere. Instead, the increasing concentration of media platforms under a handful of corporate conglomerates combines with, among other things: a marketized media culture that thrives on scandal and drama as opposed to complex policy debate; increasing political activism on the part of media owners and corporate advertisers; and a culture of political journalism where success and prestige depends on “access” to—and thus the goodwill of—established elites. Disenchanted as citizens may be with the established order of things, the public sphere remains excessively resistant to inputs that diverge from it. Despite the perception that the rise of the internet and social media expand opportunities for citizen expression, the political public sphere requires means through which concerns from across society can be brought into contact with one another and tested against each other. If the public sphere as an institution fails in its ability to cypher voices from the periphery to the centre, citizens alienated from established parties in times of crisis are left with few avenues to express their concerns and mobilize as part of a society-wide process oriented to the common good. The intransigence of a hegemonized public sphere can even make it easier for charismatic figures to “break through” using simplified, emotional, or sensationalistic appeals to gather support for questionable political agendas. In this scenario, the norms of “reasonable” disagreement begin to break down. Instead of a choice among political platforms addressed to the citizenry at large, the polity is confronted by factional competition among interests not oriented to the good of the whole—be they those of a discredited status quo or the populist energies of disaffected groups. This metastasized conflict is then converted mechanically through voting into binding decisions, which are formally legitimate, but which appear unreasonable or outright erratic to the citizenry at large. They no longer feel democratic. Colin Crouch has argued that we are slowly moving from a state of democracy to one of “post-democracy,” where we continue to live among the trappings of democracy, but they “increasingly become a formal shell.” Such a society not just undesirable; in times of protracted economic or social crisis, it is also unstable. Since the 2007/8 crisis, major parties have been either indifferent or ineffective in channelling citizen discontent into productive public debate. In this light, it is unsurprising that many citizens have lost faith in major parties, experts, and even mainstream media institutions. The paradox is that these are the very institutions that make democratic politics coherent in the first place. If citizens perceive that major political parties are unresponsive to their needs, citizens are liable to reject the legitimacy of their leadership in framing political debate. But without a functioning public sphere, citizens cannot effectively hold parties to account or participate in the development of new alternatives for the country as a whole. 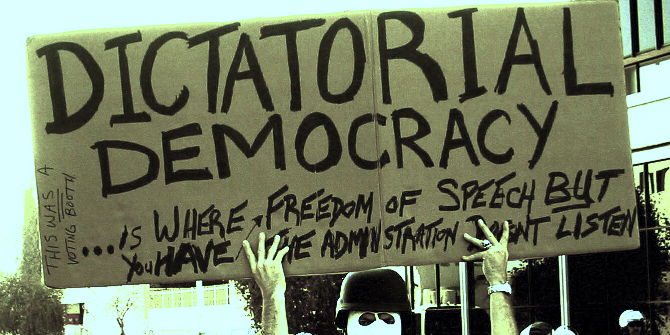 What we are left with is not “too much democracy,” but fragmented democracy. The answer to the breaking down of democracy is not to restrict democracy, but to understand and repair the societal institutions that must come together to make it work. As citizens in the UK and the US muddle through Brexit and Trump, this is the task that lies before us. Note: This article first appeared at our sister site, LSE Brexit. It gives the views of the author, not the position of EUROPP – European Politics and Policy or the London School of Economics. Brian Milstein is a Research Associate and Lecturer in International Political Theory at the Excellence Cluster “The Formation of Normative Orders,” Goethe-Universität Frankfurt.